A small molecule ABX300 could provide valuable help in combating the global epidemic of obesity. When it was fed to obese mice, the animals' metabolism sped up and their excess weight was shed. It is doing so by recruiting the help of a body's own genes in countering the effects of a high-fat diet. The research team conducting the study believes their findings may provide a new unexplored therapeutic approach to fighting excessive weight gain in cases where diets or exercise have no effect. The study was led by Julien Santo, Celia Lopez-Herrera and Cécile Apolit of a French biotechnology company, and is published in Springer Nature's International Journal of Obesity. A high-fat diet may contribute to obesity in some individuals. Treatment in such situations has focused on behavioral changes, which is highly challenging to achieve for the general population on a long term basis. This study introduces the concept of recruiting the help of our genes in countering the effects of a high-fat diet, instead of focusing on reducing the intake of high-fat food. Researchers know that the structure of some genes that help to produce certain proteins can actually change when someone constantly eats too much high-fat food. In the process, the person can become overweight or obese, or develop other lifestyle-related metabolic disorders such as diabetes or heart problems. In many cases, the same gene can produce two or more alternate proteins, based on how the translation from DNA (gene) to proteins is processed. One of these genes is LMNA, which plays a role in the development of different metabolic disorders. The LMNA RNA, which is the genetic material resulting from a process called DNA transcription, is modified by three SR proteins called SRSFI, SRSF5, and SRSF6. In this process called splicing, the genetic material encoded in the RNA is basically diced or shifted around and therefore alters the resulting proteins. 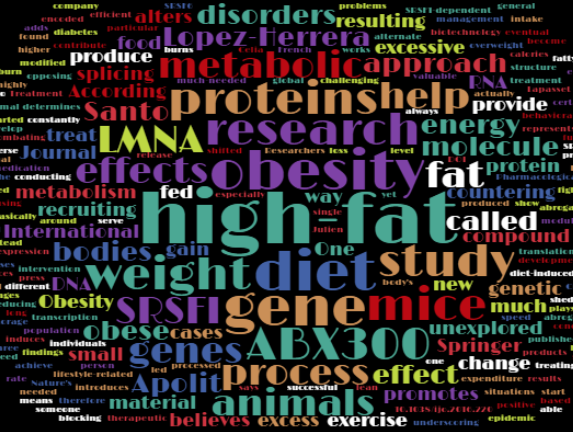 The research team found that a small molecule ABX300 is able to change the way one particular SR protein, SRSFI, works in the bodies of mice that gained excessive weight after being fed a high-fat diet. SRSFI determines which of the gene products of opposing effects could be produced from a single LMNA gene. One gene product promotes fat storage, the other opposes it. This study showed that blocking SRSFI with a compound promotes gene expression of the protein that burns calories and prevents fat gain or induces fat loss when mice are on a high-fat diet. It did not have any effect on lean mice of normal weight. According to the research team, this approach alters the animals' metabolic rate or energy expenditure. It means that it can speed up the metabolism of obese animals and that their bodies start to function at a higher energy level shedding the excess weight. In the process, their bodies started to burn much more fat, as especially fatty acids serve as much-needed sources of energy. "The results of this animal study show that this molecule can abrogate or do away with the effect of a high-fat diet," says Santo. "Dietary management and exercise are not always successful as an intervention for obesity, underscoring the need for efficient medication to treat metabolic disorders," adds Lopez-Herrera, who believes that this treatment represents an as yet unexplored approach to treating obesity. According to Apolit, this compound did not seem to have any adverse effects, so more research in animals and eventual research in humans is needed. If the studies are positive, this may be a new way to treat obesity. Citation: Santo J, Lopez-Herrera C, Apolit C, Bareche Y, Lapasset L, et. al. 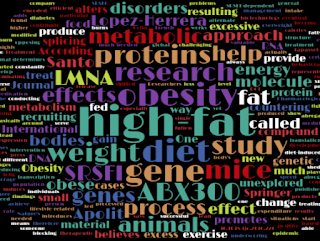 "Pharmacological modulation of LMNA SRSF1-dependent splicing abrogates diet-induced obesity in mice". International Journal of Obesity 2016. Adapted from press release by Springer.